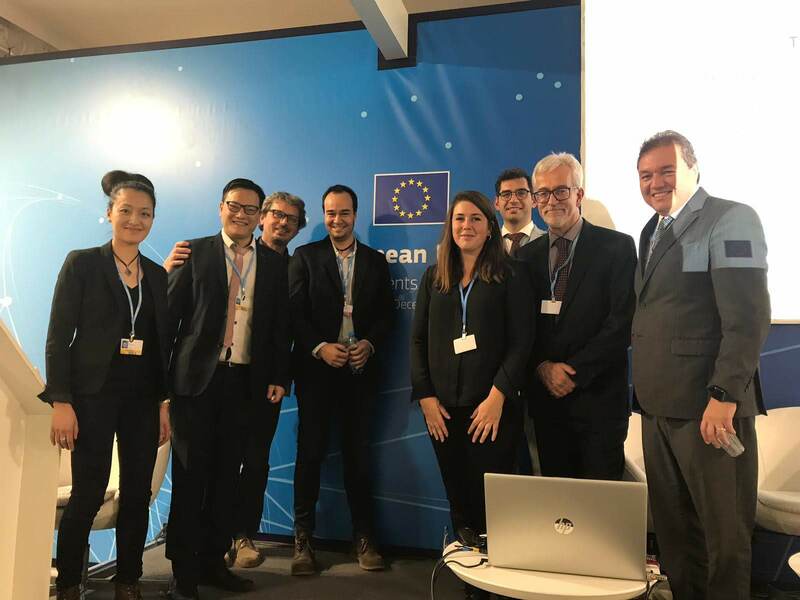 New climate services can help societies and companies adapt to climate change, representatives of S2S4E said at a side-event during COP24 on 5th December. BSC researcher and S2S4E project coordinator Albert Soret attended, together with SMHI’s scientific leader Ilias Pechlivanidis, the last United Nations Climate Change Conference COP24 in Katowice, Poland from 2-14 December 2018. Our S2S4E partners’ intervention took place within the program of side-events organised by the European Commission’s DG Climate, DG GROW and DG Environment to bring together the latest climate-related developments in a wide variety of sectors. Specifically, Soret and Pechlivanidis spoke in the joint session entitled "Climate innovations for low-carbon and climate-resilient transitions". The Conference brought together representatives of the nearly 200 countries that are part of the United Nations Framework Convention on Climate Change (UNFCCC), as well as numerous NGOs and climate and environmental experts. The aim of the conference was to maintain international efforts to solve problems associated with climate change and examine the implementation of agreements and commitments of the parties, based on their shared objectives, the experience gained and the new scientific discoveries. In this 2018 edition, 23,000 people attended, and among the participants were a wide range of highly influential people such as policymakers, celebrities and renowned scientists and activists. Soret and Pechlivanidis spoke about climate innovation and how climate services can help societies to develop and better adapt to climate variability and change. In line with the aims of S2S4E, the message they sent was climate services are the key to reach adaptation. Our ability to predict climate in the sub-seasonal and seasonal time scales was discussed by Soret in the context of the energy market. Pechlivanidis, meanwhile, talked about the communication gaps that exist between service providers and users. There is currently a need for climate services experts to move from being just service providers to become actual knowledge purveyors. This is an emerging concept to identify a community of experts understanding both climate data and user needs, and can hence offer a guidance on how to best extract and use the climate information at hand. They also emphasised that it is important that science collaborates more tightly with public administrations and companies, in order to implement practices needed to reduce carbon emissions. Such collaboration would help them be prepared for probable changes in climate, as many of the areas where they will develop their activities could become affected by climate change. A side message from their talk was that many of these collaborations have already been set up, either in the form of EU-funded projects, contracts or tenders. In fact, the various speakers in the joint session represented more than a dozen projects, past or present, trying to foster that kind of cooperation. These projects were: CLARA, S2S4E, EUCP, MED-GOLD, VISCA, HIATUS, CLINSA, IMPREX, EUPORIAS, MARCO, EUMACS, COACCH, CLARITY, AQUACLEW and several Copernicus-ECMWF contracts (Global Impacts, WaterSIS and SWICCA). The 24th conference of the parties is over now and time will tell whether it can be considered a success. What will remain is the powerful message sent by our colleagues from S2S4E, Soret and Pechlivanidis: climate services and the new concept of climate knowledge purveyors, can really make a difference in how climate change and its impact is tackled.